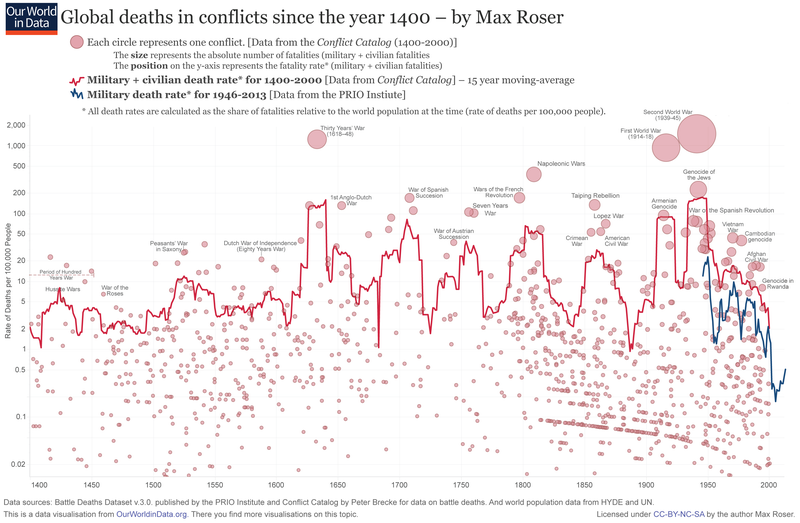 Oxford University’s Max Roser has meticulously pieced together a chart showing the global death rate from war over the past 600 years—and it paints a surprisingly optimistic picture. Each circle in the chart represents a conflict (data was pulled from the Conflict Catalog, 1400-2000 — so it doesn’t include the past 15 years). The size of each circle corresponds to the absolute number of fatalities (both military and civilian), while its position along the vertical axis represents the fatality rate. The scale at the bottom conveys when the conflict transpired. Red lines in the chart represent military and civilian deaths, while the blue line (which only appears after WWII) represents just military deaths. Data points that stick out include the Thirty Years War, the War of Spanish Succession, Wars of the French Revolution, the Napoleonic Wars, the Taiping Rebellion, the two World Wars, and the Holocaust. But after 1946 things drop off dramatically. It’s an open question as to why. The bi-polar geopolitical arrangement during the Cold War certainly served as a stabilizing force. Another explanation is that, for whatever reason, we are becoming a less combative civilization (e.g. better institutions, more democracies, the presence of nukes, etc.). It’s also possible that the downswing is temporary. That tiny uptick of military deaths at the year 2000 is representative of a larger upward trend since that time, as witnessed by the civil war in Syria and the activities in ISIS in that country and Iraq. This chart is obviously open to a lot of interpretation. Please let me know what story you think it tells in comments. And be sure to read Zack Beauchamp’s analysis in Vox. Image credit: Max Roser (2015) – ‘War and Peace before 1945’. Published online at OurWorldInData.org. Retrieved from: http://ourworldindata.org/data/war-peace… [Online Resource] A larger version of the chart can be found here.